A six-switch three-phase inverter is widely used in a high-power grid-connected system. However, the anti parallel diodes in the topology operate in the hard-switching state under the traditional control method causing severe switch loss and high electromagnetic interference problems. In order to solve the problem, this paper proposes a topology of the traditional six-switch three-phase inverter but with an additional switch and gave a new space vector modulation (SVM) scheme. In this way, the inverter can realize zero-voltage switching (ZVS) operation in all switching devices and suppress the reverse recovery current in all anti parallel diodes very well. And all the switches can operate at a fixed frequency with the new SVM scheme and have the same voltage stress as the dc-link voltage. In grid-connected application, the inverter can achieve ZVS in all the switches under the load with unity power factor or less. The aforementioned theory is verified in a 30-kW inverter prototype.. Fig. 1. ZVS three-phase inverter. Fig. 2. Inverter output current and grid voltage (10 ms/div): (a) φu = φi , (b), φu−φi = −π/6, (c) φu−φi = π/6. Fig. 3. CE voltage and current of S6 (IGBT on) (5 μs/div). Fig. 4. CE voltage and current of S6 (diode on) (2.5 μs/div). Fig. 5. CE voltage and current of S7 (25 μs/div). Fig. 6. CE voltage and current of S7 , ibus, and iLr (10 μs/div). Fig. 7. VCc and iLr (50 μs/div). In order to speed up the market acceptance of EVs/HEVs, the capital cost in charging infrastructure needs to lower as much as possible. This paper has presented an improved asymmetric half-bridge converter-fed SRM drive to provide both driving and on-board DC and AC charging functions so that the reliance on off-board charging stations is reduced. The main contributions of this paper are: (i) it combines the split converter topology with central tapped SRM windings to improve the system reliability. (ii) the developed control strategy enables the vehicle to be charged by both DC and AC power subject to availability of power sources. (iii) the battery energy balance strategy is developed to handle unequal SoC scenarios. Even through a voltage imbalance of up to 20% in the battery occurs, the impact on the driving performance is rather limited. (iv) the state-of-charge of the batteries is coordinated by the hysteresis control to optimize the battery performance; the THD of the grid-side current is 3.7% with a lower switching frequency. It needs to point out that this is a proof-of-concept study based on a 150 W SRM and low-voltage power for simulation and experiments. In the further work, the test facility will be scaled up to 50 kW. B. K. Bose, “Global energy scenario and impact of power electronics in 21st Century,” IEEE Trans. Ind. Electron., vol. 60, no. 7, pp. 2638- 2651, Jul. 2013. J. de Santiago, H. Bernhoff, B. Ekergård, S. Eriksson, S. Ferhatovic, R. Waters, and M. Leijon, “Electrical motor drivelines in commercial all-electric vehicles: a review,” IEEE Trans. Veh. Technol., vol. 61, no. 2, pp. 475-484, Feb. 2012. A. Chiba, K. Kiyota, N. Hoshi, M. Takemoto, S. Ogasawara, “Development of a rare-earth-free SR motor with high torque density for hybrid vehicles,” IEEE Trans. Energy Convers., vol. 30, no. 1, pp.175-182, Mar. 2015. K. Kiyota, and A. Chiba, “Design of switched reluctance motor competitive to 60-Kw IPMSM in third-generation hybrid electric vehicle,” IEEE Trans. Ind. Appl., vol. 48, no. 6, pp. 2303-2309, Nov./Dec. 2012. S. E. Schulz, and K. M. Rahman, “High-performance digital PI current regulator for EV switched reluctance motor drives,” IEEE Trans. Ind. Appl., vol. 39, no. 4, pp. 1118-1126, Jul./Aug. 2003. 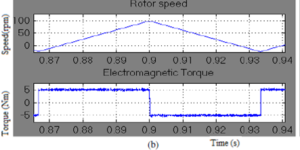 Direct Torque Control (DTC) has become a popular technique for the control of induction motor drives as it provides a fast dynamic torque response and robustness to machine parameter variations. 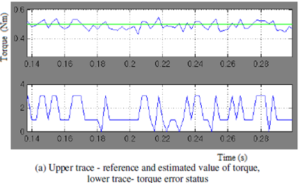 Hysteresis band control is the one of the simplest and most popular technique used in DTC of induction motor drives. However the conventional direct torque control has a variable switching frequency which causes serious problems in DTC. 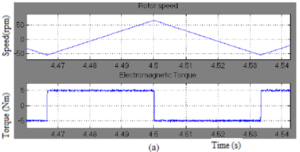 This paper presents the DTC of induction motor with a constant switching frequency torque controller. By this method constant switching frequency operation can be achieved for the inverter. Also the torque and flux ripple will get reduced by this technique. The feasibility of this method in minimizing the torque ripple is verified through some simulation results. This paper presents a constant switching frequency torque controller based DTC of induction motor drive. By using the modified torque controller the switching frequency of the inverter also becomes constant at 10 kHz. As a result, the harmonic contents in the phase currents are very much reduced. So the phase current distortion is reduced. 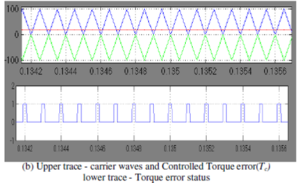 The torque ripple is also reduced by replacing the torque hysteresis controller with the modified torque controller. Moreover, with the modified torque controller, an almost circular stator flux locus is obtained. Without sacrificing the dynamic performance of the hysteresis controller, the modified scheme gives constant switching frequency. This work can be implemented using DSP. The work can be extended by increasing the switching frequency above audible range, i.e. more or equal to 20 kHz. This is an effective way to shift the PWM harmonics out of human audible frequency range. With high switching frequency the harmonic content of stator current will be reduced significantly. John R G Schofield, (1995) “Direct Torque Control – DTC”, IEE, Savoy Place, London WC2R 0BL, UK. Tang, L.Zhong, M.F.Rahman, Y.Hu,(2002)“An Investigation of a modified Direct Torque Control Strategy for flux and torque ripple reduction for Induction Machine drive system with fixed switching frequency”, 37th IAS Annual Meeting Ind. Appl. Conf. Rec., Vol. 1, pp. 104-111. J-K. Kang, D-W Chung, S. K. Sul, (2001) “Analysis and prediction of inverter switching frequency in direct torque control of induction machine based on hysteresis bands and machine parameters”, IEEE Transactions on Industrial Electronics, Vol. 48, No. 3, pp. 545-553. Casadei, G.Gandi,G.Serra,A.Tani,(1994)“Switching strategies in direct torque control of induction machines,” in Proc. Of ICEM’94, Paris (F), pp. 204-209. This paper presents a unified control strategy that enables both islanded and grid-tied operations of three-phase inverter in distributed generation, with no need for switching between two corresponding controllers or critical islanding detection. The proposed control strategy composes of an inner inductor current loop, and a novel voltage loop in the synchronous reference frame. The inverter is regulated as a current source just by the inner inductor current loop in grid-tied operation, and the voltage controller is automatically activated to regulate the load voltage upon the occurrence of islanding. Furthermore, the waveforms of the grid current in the grid-tied mode and the load voltage in the islanding mode are distorted under nonlinear local load with the conventional strategy. And this issue is addressed by proposing a unified load current feedforward in this paper. Additionally, this paper presents the detailed analysis and the parameter design of the control strategy. Finally, the effectiveness of the proposed control strategy is validated by the simulation results. Fig. 1. Overall block diagram of the proposed unified control strategy. Fig. 2. Simulation waveforms of load voltage vC a , grid current iga, and inductor current iLa when DG is in the grid-tied mode under condition of the step down of the grid current reference from 9 A to 5 A with: (a) conventional voltage mode control, and (b) proposed unified control strategy. Fig. 3. Simulation waveforms of load voltage vC a , grid current iga, and inductor current iLa when DG is transferred from the grid-tied mode to the islanded mode with: (a) conventional hybrid voltage and current mode control, and (b) proposed unified control strategy. A unified control strategy was proposed for three-phase inverter in DG to operate in both islanded and grid-tied modes, with no need for switching between two different control architectures or critical islanding detection. A novel voltage controller was presented. It is inactivated in the grid-tied mode, and the DG operates as a current source with fast dynamic performance. Upon the utility outage, the voltage controller can automatically be activated to regulate the load voltage. Moreover, a novel load current feed forward was proposed, and it can improve the waveform quality of both the grid current in the grid-tied mode and the load voltage in the islanded mode. The proposed unified control strategy was verified by the simulation results. R. C. Dugan and T. E. McDermott, “Distributed generation,” IEEE Ind. Appl. Mag., vol. 8, no. 2, pp. 19–25, Mar./Apr. 2002. R. H. Lasseter, “Microgrids and distributed generation,” J. Energy Eng., vol. 133, no. 3, pp. 144–149, Sep. 2007. C. Mozina, “Impact of green power distributed generation,” IEEE Ind. Appl. Mag., vol. 16, no. 4, pp. 55–62, Jul./Aug. 2010. IEEE Recommended Practice for Utility Interface of Photovoltaic(PV) Systems, IEEE Standard 929-2000, 2000. IEEE Standard for Interconnecting Distributed Resources with Electric Power Systems, IEEE Standard 1547-2003, 2003. This paper proposed a novel prescient variable structure-exchanging based current controller for a three-stage stack driven by a power inverter. The structure details are strength to stack electrical parameters, quick powerful reaction, decreased exchanging recurrence, and straightforward equipment usage. So as to meet past details, a sliding mode controller has been produced, which is structured as limited state automata, and executed with a field-programmable entryway exhibit (FPGA) gadget. The exchanging system actualized inside the state progress chart accommodates a base number of switches by the three-stage inverter that is affirmed through reproduction and exploratory outcomes. Its direction utilizing the proposed control law gives great transient reaction by the brushless air conditioning engine control. In any case, this does not confine the more extensive appropriateness of the proposed controller that is reasonable for various kinds of air conditioning loads (rectifier and inverter) and acmotors (acceptance, synchronous, and hesitance). Another coherent FPGA torque and speed controller is produced, broke down, and tentatively confirmed. Fig.1. Basic Circuit Of A VSI. M. P. Kazmierkowski, R. Krishnan, F. Blaabjerg, and J. D. Irwin, Control in Power Electronics: Selected Problems. New York: Academic, 2002. R. Kennel, A. Linder, and M. Linke, “Generalized predictive control (GPC)—Ready for use in drive applications?” in Proc. IEEE Power Electron. Spec. Conf., 2001, vol. 4, pp. 1839–1844. A. Malinowski and H. Yu, “Comparison of embedded system design for industrial applications,” IEEE Trans. Ind. Informat., vol. 7, no. 2, pp. 244– 254, May 2011. C. Buccella, C. Cecati, and H. Latafat, “Digital control of power converters—A survey,” IEEE Trans. Ind. Informat., vol. 8, no. 3, pp. 437– 447, Aug. 2012. E. Monmasson and M. N. Cirstea, “FPGA design methodology for industrial control systems—A review,” IEEE Trans. Ind. Electron., vol. 54, no. 4, pp. 1824–1842, Apr. 2007.